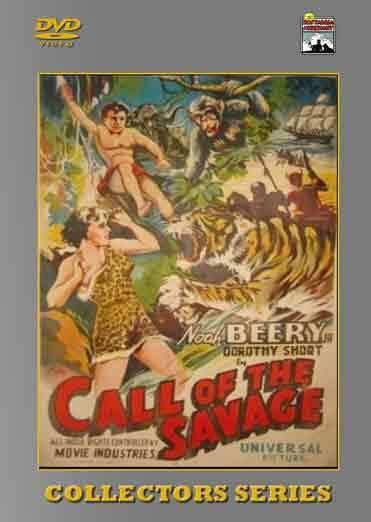 CALL OF THE SAVAGE tells the story of ‘Jan of the Jungle’, who first appeared in Argosy Magazine in 1931. Abandoned without parents as a child in darkest Africa, where his father was searching for a valuable cure for infantile paralysis, Jan grows up as a jungle boy living a peaceful life with his animal friends. But that peaceful life suddenly becomes filled with danger, as unscrupulous scientists invade his jungle world, determined to find the extremely valuable discovery that Jan’s father left with him so many years ago. Follow Jan through 12 chapters of perils and excitement, as Jan fights to keep himself and his friends alive and preserve his father’s discovery for the good of mankind. 2 DVD Set – 12 Chapters (1935).